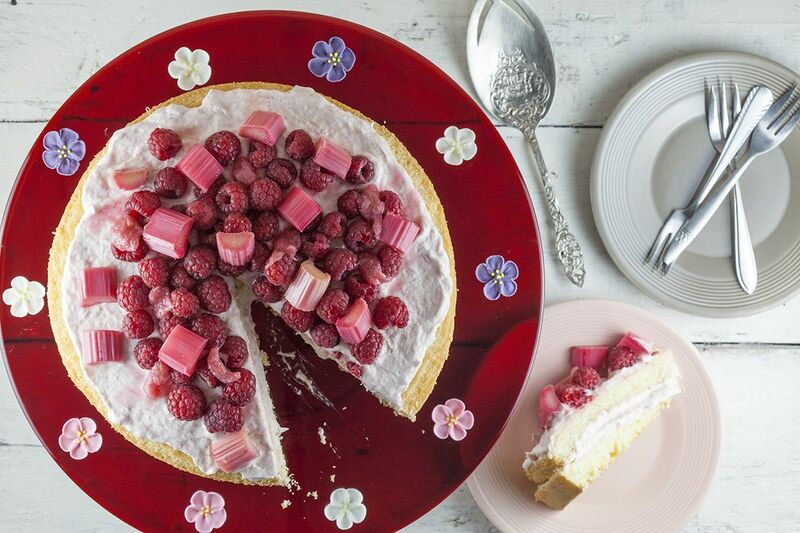 Start with the rhubarb compote, so it has time to cool off. PRE-HEAT the oven to 150 degrees Celsius or 300 degrees Fahrenheit. COAT the spring form with butter and a small layer of flour. ADD the eggs and 150 grams of sugar to the bowl of your standmixer and MIX until it’s pale and fluffy. ADD a pinch of salt and carefully fold in the flour, make sure the batter stays as fluffy as possible. POUR the batter into the prepared spring form and BAKE in the oven for about 20 minutes. Baking time depends on the oven, so check with a wooden skewer if the cake is done. Never open the oven door too fast, otherwise the cake can collapse. The cake is done when the toothpick comes out clean. Let it cool off completely. 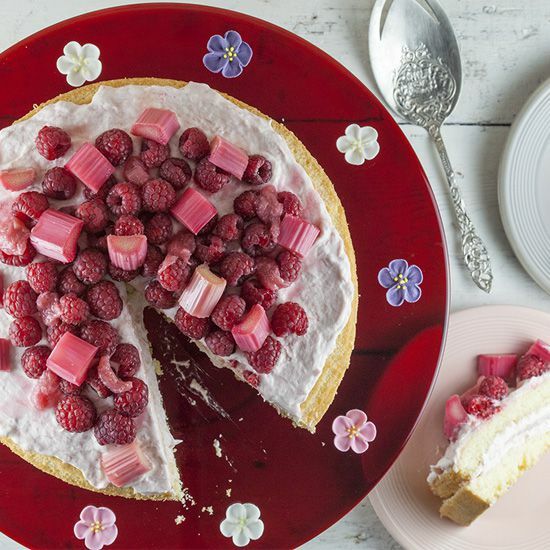 When the cake is in the oven, you can prepare the rhubarb. CHOP off the ends of the stalks and chop into equal pieces. PLACE the pieces into the oven dish and drizzle with orange juice and sugar. COVER with tin foil and as soon as the cake is out of the oven, turn up the heat to 175 degrees Celsius or 350 degrees Fahrenheit. BAKE the rhubarb pieces in the oven for about 8 minutes, or until it’s done. They shouldn’t be too soft, otherwise they’ll fall apart. Let them cool off. BEAT the cream and then stir in the rhubarb compote, about 200 grams. DIVIDE the cake into halves and coat the bottom with about 2/3rd of the cream mixture. PLACE the second cake on top. COAT the top with the rest of the cream. 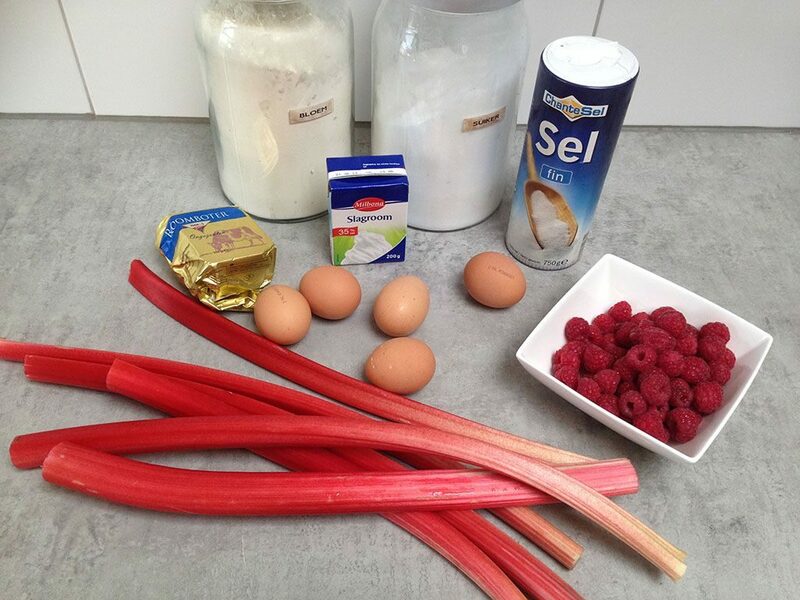 FINISH the pie with the raspberries and pieces of rhubarb. 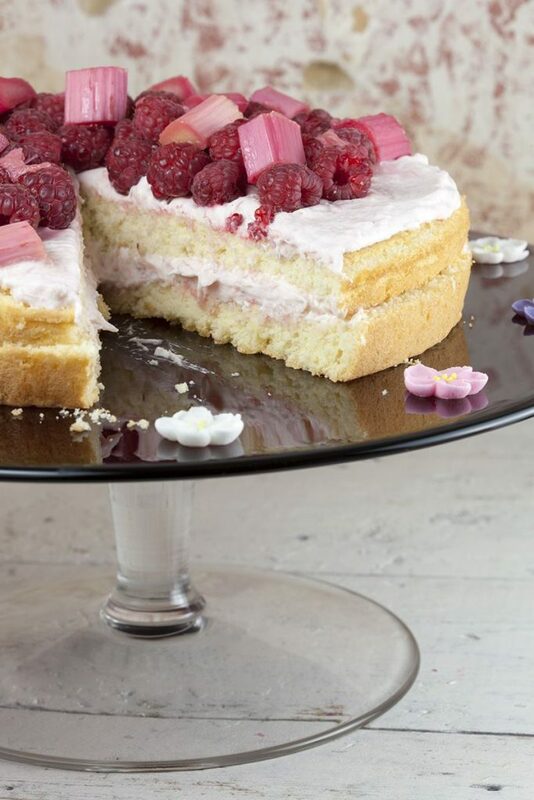 You can also ADD a few dots of rhubarb compote on top. Enjoy!